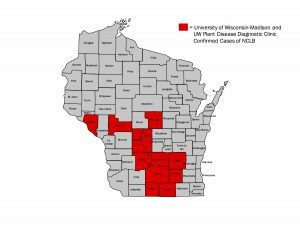 Since the first 2016 confirmation of northern corn leaf blight (NCLB) in Wisconsin on June 16, we have received additional corn samples from other areas of the state in my laboratory and also in the University of Wisconsin Plant Disease Diagnostic Clinic. All confirmations have been made in the laboratory, confirming the presence of the pathogen. Figure 1 shows counties, highlighted in red, where corn samples originated and were confirmed with NCLB. Figure 1. Wisconsin Counties Where NCLB has been confirmed as of June 19, 2016. While it is unusually early to find NCLB at this incidence level in Wisconsin, I continue to urge you to remain patient. All samples that we have examined have had low severity (very few and/or small lesions present on a single leaf). In addition, most of the damage has been confirmed on lower leaves which do not contribute as much to yield as the ear leaves eventually will. As I mentioned in my previous post on June 16, Our economic analyses indicate that the likelihood of positive return on investment from a fungicide will be higher when the application is made as close to the tasseling period as possible. Considering that the weather this week is very dry and severity of NCLB has been relatively low, I would encourage growers to wait until closer to tasseling before making the decision to apply fungicide. If weather over the next week or two begins to turn continually wet, then this decision should be re-evaluated at that time. To learn more about NCLB and return on investment when using fungicide CLICK HERE. To watch a video about corn diseases in Wisconsin and fungicide use in corn, CLICK HERE. Remember to continue to SCOUT, SCOUT, SCOUT! Previous post: Plant analysis are you using it and interpreting the results correctly?